Have you ever read a book where, for pretty much the entire book, you have no clue what is going on? And did you love every minute of it? That, my friends, was my experience with this book. The author, Sara Shepard, is best known for her book, Pretty Little Liars, upon which the television series is based. I have neither read nor seen PLL, so I wasn't familiar with her style. I have, however, been on a thriller kick lately. Thrillers are like drugs, the more you read, the more you need. This was definitely a book that hit the right receptors and made me want to keep coming back for more. Here's the thing, I never knew what to believe. There are two stories going on here, Eliza's own story and the novel that she wrote. In many ways, this novel reminded me of another book that I loved, The Bookseller by Cynthia Swanson. The two stories are so intertwined that the line between fact and fiction blurs and then disintegrates. Shepard's writing style is the perfect fit for this story. 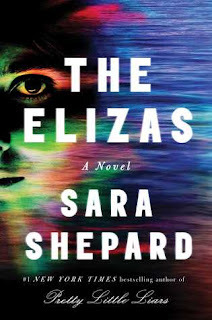 She has the conversational, dry tone necessary to capture the narcissistic world in which Eliza lives, but she is still able to keep the momentum growing as Eliza's life spins further out of control and closer to the truth. In many ways, this book seems primed for a film or television adaptation. While I won't say it is "action-packed," it does spend far more time with the characters doing things than sitting inside someone's thoughts...which is surprising considering the subject of the novel. I've tried to not get into the meat of the novel because I don't want to spoil anything (trust me, you'll thank me). But I will say this...the end will give you shivers. This is a fantastic psychological thriller and one that I would readily recommend to anyone.